Mishing Renaissance: Ali-Aye Ligang, meaning and message. Festivals are mainly designed for human entertainment after a season of hard work. It is nourished with religious flavour to make it ethical, sincere and regular. Since aeons human beings celebrate every rewarding endeavour with merriment, relaxation and leisure. Festival is an occasion of such merriment. India, being an agro based economy, a majority of its inhabitants toil in the field throughout the year. Depending on the mood and timings of monsoon, the agricultural cycle is divided into different phases, like sowing, weeding, reaping or harvesting. After the end of each cycle, people used to celebrate their hard work and do a little merriment. Along with celebration worship is associated to pay tribute to the natural forces for bountiful harvest in a sense a wish or prayer for success of their mission. Many festivals across Indian sub continent are associated with harvest by different names, by different groups and by different ways. It is atype of celebration which indicates ‘mission accomplished’. Ali-ayeLigang, a weeklong festival of Mishings depicts the same spirit of celebration in advent of sowing season after a cycle of bountiful harvest. It associates both harvesting and beginning of another new cycle of agriculture. Celebrated in the month of Fagun of Bengali calendar (February-March), the festival unites Mishing spirits irrespective of age, to a weeklong merriment. The name itself indicates that this is the beginning of sowing seeds in the heart of mother earth. Ali means potato, denotes roots of plants, Aye denotes fruits or seeds and ligang means beginning or sowing. It is a thanks giving after sowing season. Prior to the festival, which commences from Wednesday every household gets busy in procuring eatables that may last for a week. In earlier days men folks would go on hunting in groups, women collect edible leaves, vegetables, fire wood etc. Wednesday is the sowing day when people get busy in sowing their dream harvest in the field. While sowing, the Mishing makes a commitment that he would share his harvest with all, starting from highly venerated being to the lowest born animal thus: Guru ku dim, Bhakatak dim, GadhaGhodakupujim(I shall offer it to the preceptor, to the devotees, I shall worship donkeys and mules). The sense is that he is not going to enjoy the fruit of his labour alone, rather wishes to share with all living beings without being selfish. He further invokes blessings of Donyi-Polo, mother goddess KineNane for a bountiful harvest while sowing thus: ‘Donyi- Polo KojeYangoKineNane,Guumiinsoying, Sine Mobo,AkoSinnaNuluKalangkatallangKa’.RuksingMerangem, Tapum-Tayingemdomomapeka. (Oh creator, oh mother, be watchful, guard and save our crops from insects, surplus will be at your service). Now a day due to urbanisation, where fields are not there like villages, people spread seeds in an enclosure and encircled it by threads and put cotton balls on the reeds that act like a fence. This is done in Murongs. On Thursday, Mishings burn lamps (traditionalDiya)by engaging Atula(Bhakat) in his house invoking the departed forefathers and seek their blessings for constant happiness and prosperity in the house. A spade, symbolising agricultural tool is covered with a particular leaf (Tara Pat) and placed in a corner undisturbed till the end of the festival. 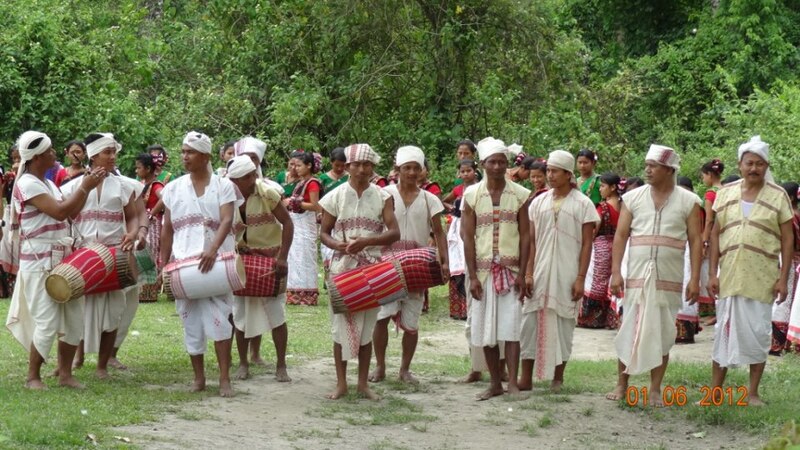 After burning of the earthen lamp and completion of invocation formalities, the house hold is ready to invite cowherd boys to feast and dance (Gumrag) who enter in to house with singing and dancing. The boys go round every house one by one taking care not to spare any house in between. Then comes the turn of young adults who with equal joyous spirit invade each house with dancing and singing, of course not without feasting. Next the older generation come to dance and the show goes on. 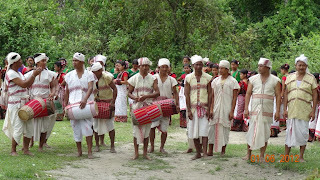 Normally the dance starts from village head’s house or the senior most individual’s house as a mark of respect. The beginning of the festival is announced by sound of gongs carried by boys to every door. During the celebration certain taboos are observed. No violence, crime, bloodshed is committed or permitted to any animal. No tree is cut, no leaf is plucked, even no vegetable collected during these days. The household gives no grains in any condition to outsiders under no circumstances, even in exchange or barter but money can be parted out in exchange of things. The bright side is, this is a time for courting beautiful maidens by young adults in the midst of merriment many of which materialised in to lifelong bond of marriage later on. Flow of celebration approaches ending which is called Liilen on the next Monday. People who could not completed invoking ancestors and lighting the lamps must do this on this day. The spade which had been kept religiously at rest covered with leaf is uncovered by removing leaves. Again the Mishingfarmer go to the already shown field and furrowed it. Then in the afternoon the field is levelled. The whole Tuesday next, taboo is observed but dancing and feasting continue. The festival slowly comes to an end leaving people to wait for it for another year. 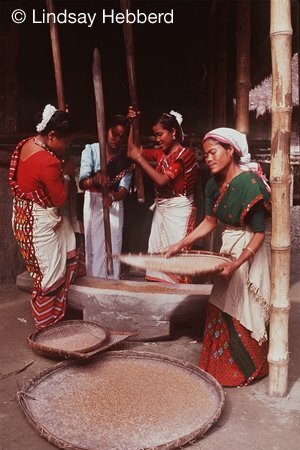 Mishings largely an agro based tribal of Assam and Arunachal are a hard working people. Despite of hardships and natural calamities, they survive and prosper. 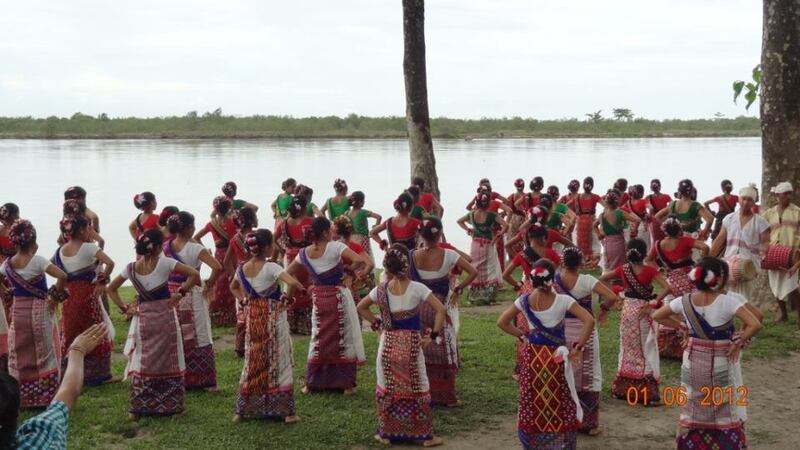 Being the largest plain tribe of Assam, they have made headways in many fields and the most admirable thing is making their language and literature to prosper during the last decade. No tribe has dedicated so much for development of literature like Mishings. In celebrating festivals even in modern days Mishings have never waned in their spirit and style. They have a great message behind this celebration. The recitation during sowing reflects an unselfish attitude of sharing his produce with all, human and non human, highest to the lowest beings etc. Second thing is by observing taboo during celebration, Mishings convey message of non violence and protection of environment to the world. Even if it is for a few days they refrain from cutting trees and harming animals during festival. This is the nicest part of Ali-ayeLigang. Tani:yé-taniké turnamsok gyan atíém tíkumna lé:do.Édé tíkumnam gyan kídardém gyan komsung émdo.Édé gyan komsungí:dém GOMLABÉ émdo.Gomlab ki tani:yé tani: opínnok unnotiyém arsi kísapé ka:sudo.Édílai ame ame: né opín kídarké nappalok lubomsula du:nam agom kídardété mo:písok bottané manggom adgabnam agompé idoku.Édé agomídok asin mé:namém lusatsunado.Tani:yé tani:ké mé:namdém ayyompé lusatsunané kasudogom,aíké agom gomlabém turra du:mola:ma:mílo,kapé ka:yumné ko:nédé ka:yumdaggom opan panné kísadag.Kapé émilo,ka:yumdaggom opan panmílo amme lure: luse:dag.Édémí:pé aíké agom gomlabé du:su:daggom édém adman agompé ima:takamém amme lure: lusedag.Oko opínlokké aíké adman gomlabé ka:sumaji édé opíndém amme tani: opín kísapé tomang.Opín ako turra du:pé buluké kérang lamku,gíné adí,agin adí odokké me:lam adí takamém ka:suru:pé idag.Opín ara:do yelam-kumli,Milam-lamli,murkong ili,do:pín do:yíng,kéba: ba:lam,gí:dí orman atí agomém síkkupé mé:mílo agom gomlabém síkku ru:pé idag.Opín dok ré:badnam,ké:íkpé otoknam takamdém gomlablo:pag du:dag.Émpila oko opín lokké aíké agom gomlabé kasumayeji édé opíndém amme ré:badné opín kísapé mé:mang.Edémpila gomlabém opínnok arsé émnasin lupé ido.Gomlab ki opínnok dumsígém ka:la:sudo.Oko opíndokké yelod-daglog,kéba: ba:lod,ili-ikamé kapidoji édé opíndok gomlabé:sin édémí:pé ido.Tani:é apin doma:pé dumílo kapé kísa ngoluké amíré molama:pé ido,édémí:pé agom gomlabé:sin adné pané kama:mílo aso asopé siya:la longé kolo yokpagdo.Amír sok dogangé apiné,tani: atuklok dogangé gomlabé.Tani: takamlo gomlabé du:do.Se:kai alla,sekai pola,sekai do:yipé sekai ni:tompé gomlabém lusarsudo.Atukké agree anu anu gomlabém mé:lennamé.Éddíko atugé mé:ladoji déddí:ngko atugé raddo.Ngolu turra du:pémé:mílo odokké adí lékorém korpí:pé mé:mílo,angu opín kídarké me:lamlo korpípé mé:mílo gomlabém lappéru:ng iye. Ngolu asutko amigém bérsa:la ka:mílo mo:pí sok De:g lang opín olungé kapé réngamké milam lamnam,migom donam atí agerém kapé Gomlabé ré:badboduji sém Gomlabé bérokpé léng- kanbidag.Gomlabé silo ké ayir so tani: yenamém odokké bélu bé:léng dumsigém angu modung.Tani: amo:so tani takamké aimané,lo:rima:né ager kídardém írbi:n-bodag.Golamki gomsar,do:ying,mé:tom, a:bang-ngi:tom alla ainé agerko réngam légapé gerboladag.Agom gomlablo éddíko oktiyé kadagji déddíko abbuk guli, i: épuk,Bom,Yoksa –Gídínglo oktiyé kamang.Lukanko-popé Pop ké aimané do:yi do:mo,gérmurger-yang ager kídardém gomlabé:pak la:pagboto.oko opíndo aíké opín aibonam légapé gomlabém labboma:ji, édé opíndém amme opínko émna mé:mang. Gomlab kama:né opíndé longé kolo mo:pisokké yogala gído.Édémpé amo:sokké yokpagné opíné bojeko dung.Lukanko-Popéké Mishmi do:pín potin lo Mishmi Hills so Bebejiya Mishmi émnam Mishmi opínkosin dungai émna padagai.Su édé opíndém Mishmi Hills so pa:tokumang.Édé opíndé amo:sokké yokpakkangku.Misingé:sin agom gomlabém lamboma:mílo Mising agom sim lunné kakumaye odokké longékolo Mising opín si:gom amo:sokké yokpak-ye.Misingé Mising opín ko émna mo:píso kangkinsupé Mising Agom Gomlabém lappérung iye.Tani: opín ké bottané atugé dung.Atukké ageré gomlab labnamé.Kangkin-ge:lasin ,tatkin-ge:lasin,kin-ge:lasin kinma:némpé iladu:mílo bim jati druhi,desh druhi,atmo druhi odokké atma druhi émna lupé ido.Kapé émyemílo tani: ako ako pé gíkumsula réngam ako ido.Réngam ako turra du:pé opín kangkisunapé agom dírbí,gomug gomlab kasupérung ido. Éddilai mirém rémné opíné ame:né opíném samjebla lé:nam do:yingémgom ngolu kindag.Édé mirémné opíndé édílogom samjeb nam opíndém gé:samonam do:yingém mé:mang.Éddíko paklaye:ji déddíng ko samjeppé mé:dag.Mising opínsok agom gomlabém angu opíné gé:sanamdém sékosin mé:mang.Misingé aíé mé:sumamílo mo:píso turra du:né opínko émna ammem léngkan sulama:ye.Lukanko-Jarmani,Ru:s lang Itali De:g kídarké agomlo:sin Phrans agom gomlabé migom dobomsula bojeko dungngai.Mo:písok appíngém yang botta ya:né agom émna kinnam Ingraji (English)agom gomlablo:sin Phrans lang letiné (France& Latin) agom gomlabé migom dokíto.Émpila Ingraji agomlo:sin mibo gompiré bojeko du:ngkang.Assamese lang Uriya agom gomlabémgom Bengoli gomlabé migom duliksula bojeko du:to.Me:lampé agom mimagém mokupénampé ikang.Mising agomsi ame:yau:né agomé.Sim takamé asin díkla léko lakkopé agerém germa:mílo yampo kapiyesong sekoté lulamang?Édílai milam labjemla:sin (political dominant) agom gomlamém gé:samoma:pé lé:do.Édé agomdém édé opínédé kinsukumílo mimag moropkupénampé idoku.Lukanko-Jarmani,Ru:s Itali odokké Inglend (England) kídaré Phrans lang Letin (France& Latin) gomlamém buluké agom gomlablokké mimag mola ménkupénampé ibektoku.Buluagom gomlamlok ku:né –ke:ném dola lé:tung.Bulu langi lo pitkepsuné ongopé bojeko amiké gomlab ara:lo pitkepsula du:to.Édé longé dokké bulu mibo agom gomlabém mé:botokumang.Aíké agom gomlab ki aíké De:g,Aíké opín,aíké réngamém unnoti boladak.Oko opíndok yelod daglo dé kapé idoji édémípé édé opíndok agom gomlabé:sin édémípé idag.Aíké agom gomlabém labbola éddíko amin gíla dagji déddíko ami:ké gomlabém labla amin gílamang.Aíké agom ki gomlabém labbomílo pak aíké opín,aíké réngamém ré:bad bola-ye.Aíké anémé siki-sipak moge:la amiké anémé ka:si-mosinédokké porasit mokko amo:so kamang.Édémí:pé aíké agom gomlabém mé:pa:sumaném lupé idag.Aíké agom gomlabém mo:si:sumapé ami: opín légapé gomlabém labnédé aipéi pondi dé, émdaggom aíké opín do:yingém lubisulama:mílo bim oko pondidé émna luyen? Ngo sok ki lumang,ami:ké agom do:yingém kinpé lagimang,ami: agomém poripé lagimang émna.Aíké agom do:ying,aíké agom gomlab kin-suge:la:sin mibo agom gomlabém kinnam dé aipé ainé do:yingé.Silo éddiko mibo agom gomlabém kin-yeji déddiko turnané légapé ager asongém pa:la dag.Gyan –bigyan,kinji-kinlab atí atí agom gomlabém Ingraji ki kinpé ido.Sokki silo mo:pí so akoné akoném kangkinsunado lupo tausunado.Mibo agom gomlablok do:yi do:mo kídarém aíké agom gomlablo moyin mojola aíké agom gomlabém írga:bomílo mo:píso Mising agomsi:gom mo:písok turra du:né tani: agomko émna mo:písok amme kin-ye odokké Mising agom gomlabé pu:po-jarpoye.